We're well on our way into 2015. 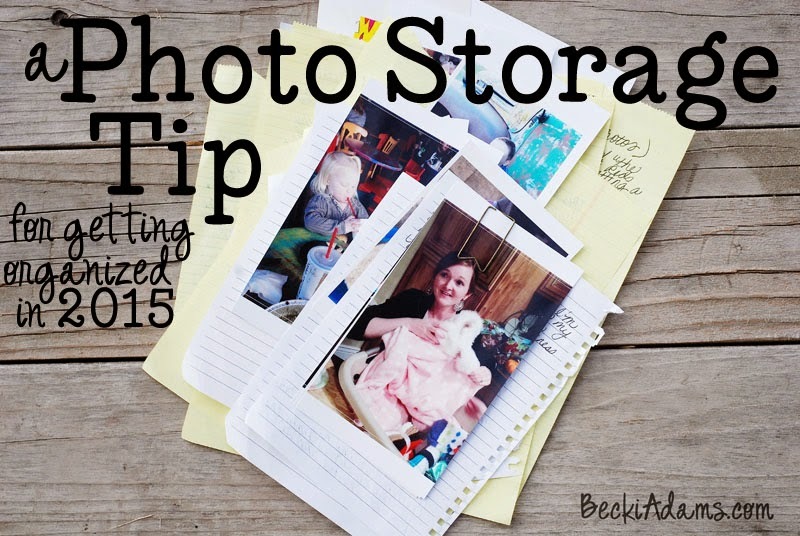 I'm excited to share with you a photo storage idea for Lets Talk Tuesday. I'm hoping this may help some of you keep your 2015 memory keeping goals. I can't say that I have a list of goals for my scrapbooking for 2015. I don't really set New Year's Resolutions. For the past couple of years I have chosen a word for the year but that's about it. I set goals throughout the year. I don't think there's any reason to wait until the beginning of a new year. I can, however, share with you my most recent memory keeping goal. "Quality vs. quantity", has been my mantra. I've tried to put my focus on the quality of the memory that I'm documenting instead of just filling albums full of beautiful layouts. With that being said, I have every intention of creating a plethora of beautiful layouts, I'm just making sure that the story that goes with that beautiful layout is there in its entirety. I should also say that when I say I want "quality" memories that doesn't mean I want only good memories or happy memories. That just means that if I'm going to make a beautiful layout I want a story to be there too. As I browse galleries, Pinterest, and Facebook I see a huge amount of beautiful layouts that don't have much of a story behind them (mine included). My goal is to change that for myself and have a story attached to every layout. We all know that goals don't mean very much without an action plan. Don't worry, I've got a plan for this goal. Most of the photos I take these days are with my phone, similar to most of you, I'm sure. This can be good: more photos in more places, at more events, and more spontaneous photos, it can also be bad: the quality of the photos isn't as good as a DSLR. My plan includes a fancy notebook (it doesn't have to be fancy though). I prefer a * 5x7 notebook this size fits perfectly in my purse. In fact, any piece of paper will do. You just need something to make notes on. Your phone would work great, if that's how you like to make notes. 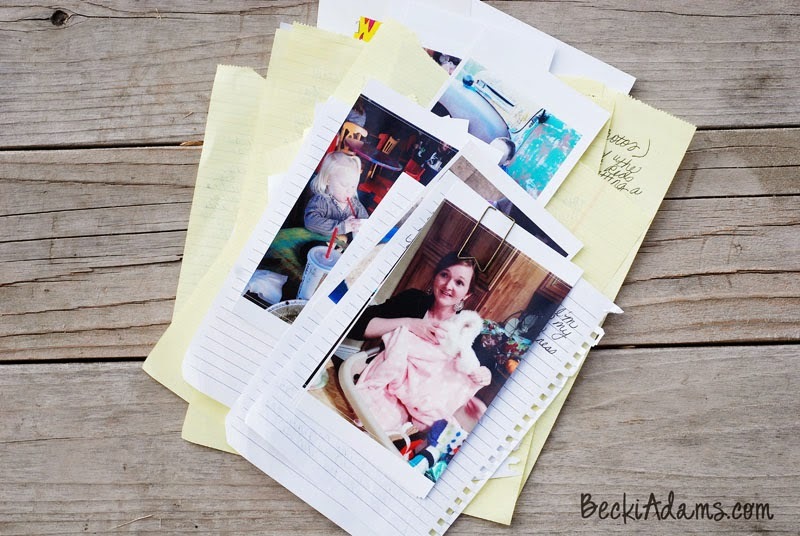 I know writing your journaling in a notebook kept in your purse isn't anything new but for me I would always forget to put the journaling and the photo together. My goal is to connect the two. If I have the journaling and the photo together when I sit down to create I feel like I've already won half of the battle. So I'm going to tear the journaling out of my notebook and tape it to the back of the photo when I print the photo. Then I'll add the photo to the small plastic basket that is waiting to be scrapbooked next to my desk. I'm hoping that by adding just the one little step of taping the photo and journaling together that I will get more meaningful, quality stories in my albums. 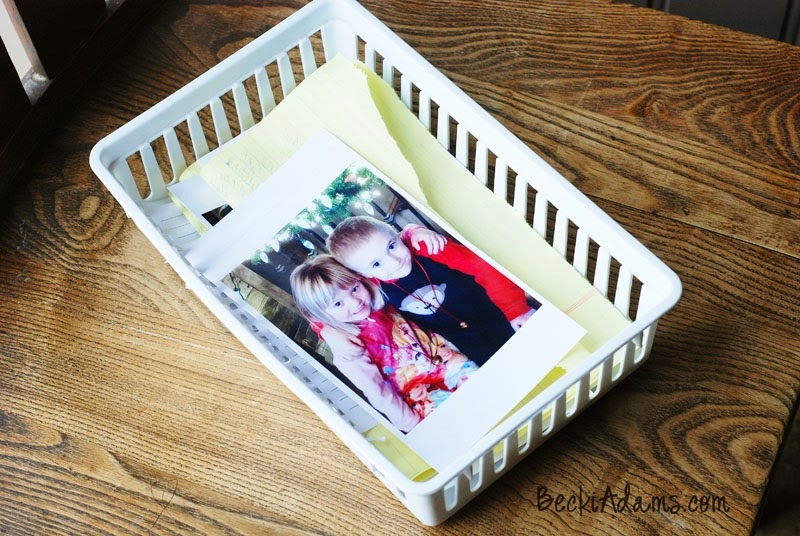 After I tape (or paperclip the photo and the journaling I put them the basket. What do you think? Do you have Memory Keeping Goals for 2015? Is this photo storage idea something that may work for you too?